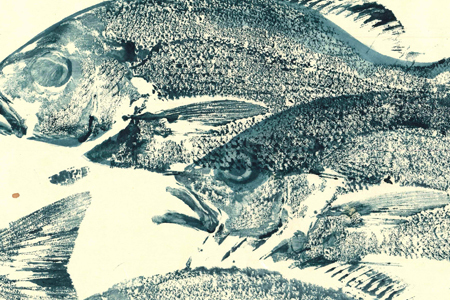 Gyotaku is the Japanese tradition of fish printing (gyo meaning fish and taku meaning rubbing). Originally a method for recording fish catches, it became an art form in its own right in the mid-1800s. Jane’s approach to making this body of work has been a simple combination of slow art and slow food: catch, print, eat. Join Jane in a workshop to learn the ancient technique of Chokusetsu-Ho. See workshops page for details.